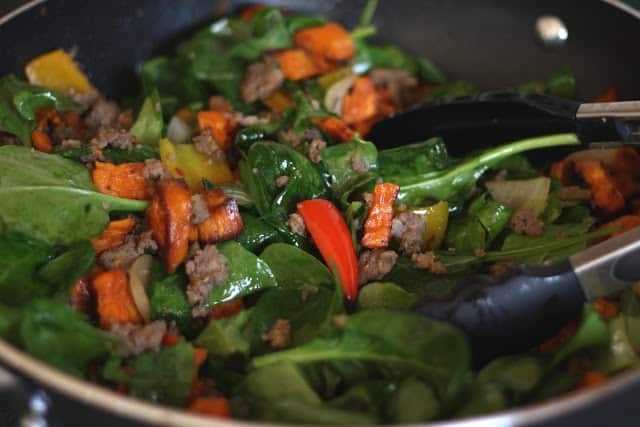 Roasted sweet potatoes, browned and slightly caramelized on the edges, are tossed with spicy hot sausage and handfuls of baby spinach or baby beet greens to create a deliciously simple dinner. The potatoes roasted while I napped on the couch and when the timer beeped, I pulled together the rest of the meal in less than 20 minutes. I love quick and simple meals on a lazy Sunday night. Back to the beet greens now, yes, you read that right. 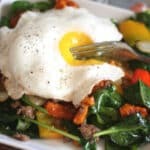 I used Baby Beet Greens and I really loved them! I’m a bit selective when it comes to greens in my kitchen. Some greens I just adore and others, I simply can’t stand. I tried beet greens last year and they were woody and bitter and they tasted like beets to me. I wrote them off as a loss and decided to ignore them in the future. However, this year, we accidentally planted a LOT of beets in our garden. As in, way way more than we could possibly eat. I’m not the biggest fan of beets and neither is my husband. My boys would happily eat them every day though, so we intended to plant a few just for them. Clarification from my husband: apparently, the plan was to plant them and thin them out as necessary. Obviously, I’m not the master gardener around here! Well, things started coming up in the garden and I had a full spread of pretty green “something” that I didn’t recognize. It looked a whole lot like the baby spinach leaves that I use every day, so I decided to pull one up and check it out. Sure enough, it was (or would have been) beets. The leaves were just beautiful though and very soft (completely unlike any fully grown beet greens I saw last year). I tasted one and it was very similar to baby spinach. I immediately decided to thin the beet section myself and use the greens in a hash that same night. We all enjoyed this meal (my three kids included!) The beet greens tasted so much like the spinach we love; I could easily see eating the entire garden’s worth of baby beet greens before any beets have a chance to appear. If you don’t happen to have an abundance of baby beet green’s on hand, I’ve made this many times with baby spinach alone and it is delicious! fork tender, and then roast a bit longer to get a slightly crisp edge. This usually takes about an hour, give or take ten minutes or so. the sausage and remove to a covered bowl to keep warm. Saute the onion and bell pepper in the same skillet over medium heat. Season with salt and pepper. When the vegetables are slightly tender and browned on the edges, add the sausage and roasted potatoes back into the pan and stir to combine. to wilt the spinach. Cover loosely with a lid to keep warm while you cook the eggs. 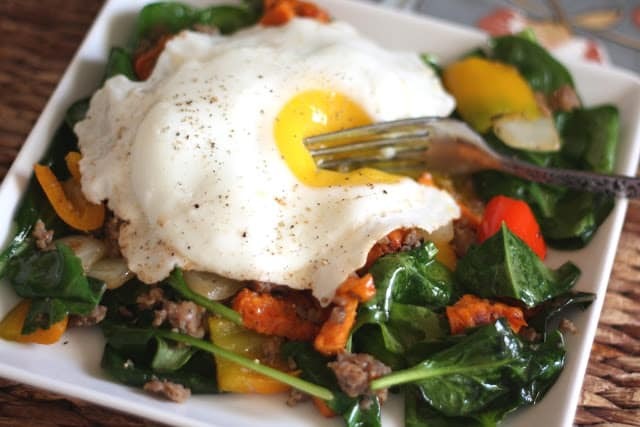 the spinach mixture with the soft eggs. Enjoy! Somehow I never think to make hashes like this but they're such a great idea! Maybe the difference in beet green taste is that they're still so young? Maybe they get less palatable the older they are. Hmm. Your pictures are fantastic, Mary! And I love that you found a little surprise in your garden!! I haven't tried beet greens but will as soon as ours come up in the garden :) Love the flavors in this dish, I bet it was yummy. Great photos ... once again! ooo pretty hash and so healthy too! It looks delicious! I could eat beets every day, LOVE them! I am gonna have to give this one a try. I've been a bit obsessed with the egg of late and I thinks this dish just enabled me. Have a great day Chickie. Let me think, would I eat that - absolutely. 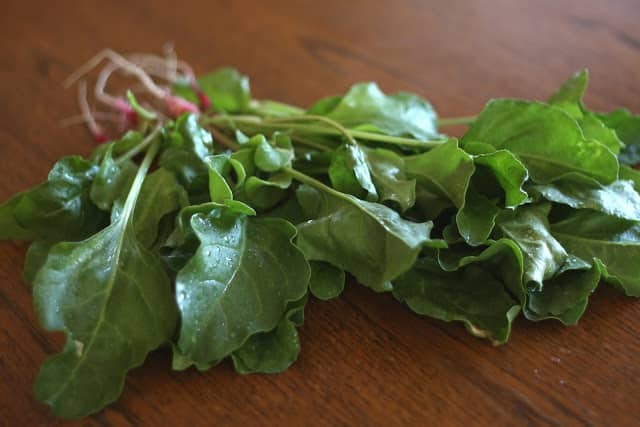 Oh my gosh those baby beet greens look amazing, I bet they are incredibly healthy. The guy at the farmer's market this week told me to eat the greens from the radishes I was buying, so I put them in our salad. I'm so inspired by this dish, and as usual your photos just make it look irresistible. This shall be my dinner mañana! This looks delicious! I would definitely use spinach, just because I love it! I really want to try this soon.